Now, please donâ€™t get me wrong, Iâ€™m sure your mum just loved the pasta craft you made for her in pre-primary. You know the kind: cardboard cut in the shape of a heart, with pieces of dry macaroni glued to it and finished with a coat of gold spray-paint. Lovely. And it doubles as a Christmas tree decoration. But letâ€™s face it, thereâ€™s not much more Mum can use that craft for than staring at and celebrating your developmental milestones. To save you from a last-minute spend-a-thon the week of Motherâ€™s Day, or from being an adult who spends their time gluing pasta to old cereal boxes, Iâ€™ve called in all the people, businesses and products I love best, to build a list of truly pampering, truly thoughtful â€“ and most importantly ACTUALLY useful gifts that Iâ€™m certain any mum would love to get her hands on. Mr Poppins+Co Kahoots Leisure Bag in "Feather". Other designs and matching towels available. Remember the bag Mary Poppins unpacked in front of an astonished Jane & Michael banks in the movie? This bag is pretty much the same. Western Australian Designers, Dori D'Orazio and Terri Ioannou came up with the idea of a large, yet stylish carry bag when their families spent New Yearâ€™s together and realised the only bag big enough to carry an entire familyâ€™s worth of outdoor gear (think: bathers, toys, hats & snacks) had to be â€œborrowedâ€� from a certain Swedish homewares store. Those big blue bags might be super handy, but letâ€™s face it, they donâ€™t look so swell in Insta stories. So, the girls drew on their combined design skills (D'Orazio is an interior designer, Ioannou, a graphic designer) to come up with an alternative. 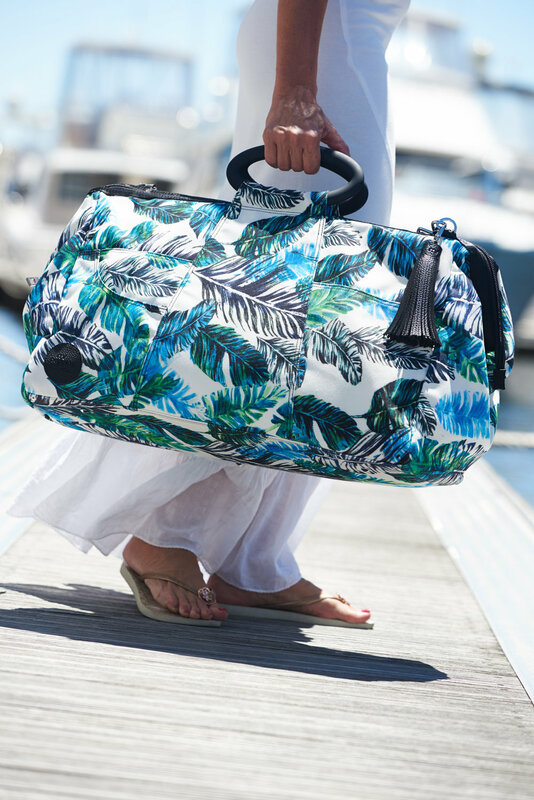 Just like the big blue bag their Kahoots leisure bag is massive, easy to carry and waterproof. The major difference though, is that the Mr Poppins+Co bag comes in four colourful designs, has a super-sturdy zip closure, and can be matched with one of their plush microfibre towels. Hereâ€™s your special offer: Get $20 off of any Mr Poppins+Co bag purchase by using the code CARMEN20 at checkout*. *Code expires June 30 2018. If your mum is into fitness of any kind, Iâ€™m willing to bet sheâ€™s already keen to give 20Fit a try. I know I was when I first read about it a couple of months ago. This is the clever new training method that uses electronic pulses (EMS) to stimulate muscles and amplify your workout in just (as the name suggests) 20 minutes. Pretty much designed for busy women who struggle to fit training into their schedule, Imogen & Bob at 20Fit Australia say itâ€™s the most efficient way to work out and get amazing results. I can vouch for it too. After suffering a couple of injuries and a bout of illness that set my training back, Iâ€™ve managed to get myself back to where I left off after just a few sessions. For mum to try it, no strings attached, 20Fit are offering this very special Two-Week Trial Pack, exclusive to readers of this blog. Don't be put off by the wires, 20Fit is a super-accessible way to train. With this special, your body scan (pictured) is included to help track your progress. Oh, and just like all the Mother's Day offers listed here. If you're keen to purchase for yourself - go right ahead. I used to waste way too much time (and money, oh, the money) on ineffective skin care. The Skin Nurse shook down my routine, took away the time-wasters, and recommended a couple of highly effective alternatives that have me loving my skin for the FIRST time ever. To give Mum (or yourself) a taste of no-fuss skincare I asked the Skin Nurse for something special, and she said: Hydrafacial. This is a no downtime, non-surgical (yay!) skin resurfacing treatment that improves tone & texture in just half an hour. To experience Hydrafacial at the special introductory price, of just $159, choose â€œHydrafacial Launch Promoâ€� when making your booking here. Or call 0491061399 to purchase a gift voucher. The bonus is she'll receive her treatment in the beautiful surrounds of The Skin Nurse's home, at Aesthetic Artistry - a luxuriously appointed salon in the heart of the King Street fashion precinct, Perth city. 4. Lashes for Days with Lash Sublime Couture. Say goodbye to mascara and panda eyes with lash extensions by lash Sublime Couture. Continuing with the pampering theme: why not treat mum to two and a half hours of relaxation & eye lash therapy? Iâ€™m lucky to work with make-up artists often and I hear over and over that my extensions by Lash Sublime Couture are the most natural-looking theyâ€™ve seen. They look dramatic and full, but remain light as your natural lashes - so you barely notice theyâ€™re there. If the mum in your life is off on holiday soon, extensions are a great gift idea, because they reduce â€œget-readyâ€� times by half. Which not only leaves more time for sight-seeing, it keeps husbands off their back! Right now, Lash Sublime Couture, (also located at the stunning Aesthetic Artistry on, King Street) is offering a very special price on their "Incredible Fairytale Lashing", of just $97. Normally $249, the treatment includes face consulting, lash mapping and 2.5 hours of naps while Mumâ€™s lash line is boosted to epic proportions. To secure the special price of $97 select â€œApril Incredible Fairytaleâ€� when making a booking here. And hurry! Or call, 0491061399 to purchase a gift voucher. 5. Absolutely anything from Nosh Gourmet. Nosh Gourmet, in lively East Victoria Park is the fail-safe gifting go to for many people these days. I like Nosh for an after-dinner wander to pick up some of the Small Batch Chocolate they make in store, or a cheeky Brie from their cheese fridge. Nosh is also home to an incredible array of food-related gift items. Choose a few pieces to create a bespoke hamper for Mum yourself, or let Dina & her team choose something they know she will love. Nosh can even deliver your gift to Mum in time for Mother's Day. More details here. To give you some Motherâ€™s Day inspo, the delightful Dina at Nosh Gourmet has put together this array of her faves - available online or in store.